ysabetwordsmith | Poem: "Make Their Own Boxes"
Poem: "Make Their Own Boxes"
This poem is spillover from the November 8, 2016 Poetry Fishbowl. It was inspired by prompts from ari_the_dodecahedron, librarygeek, and ng_moonmoth. It also fills the top row (threats from outside, generalization / specialization of members, generations, failures) in my 9-2-16 card for the Worldbuilding 4x4x4 Fest. This poem has been sponsored by ng_moonmoth. It belongs to the series An Army of One. Warning: This poem touches on some sensitive and controversial issues. Highlight to read the warnings, some of which are spoilers. There's a lot of cute kid stuff, but the adult emotional plane includes some miserable stuff. There is homesickness, hatred of current location, extreme discomfort, near-total dissatisfaction with family life, relationship issues, lack of accommodation for needs, which makes it incredibly obvious how little the neurotypical officers cared about their neurovariant staff, post-traumatic stress, questions about family, general criticism of unsupportive societies, family planning, challenges of social engineering to fill gaps in necessary services, and other issues. On the bright side, Armelle is finally starting to think about how to make Sargasso Station more livable. If these are uncomfortable considerations for you, please think about your tastes and headspace before clicking through. Armelle hated living on Sargasso Base. and the way noise bounced and echoed endlessly. without consideration for children underfoot. hadn't had much luck making new ones. was the next best thing to useless. At least Darmid was a ray of hope. of children who had come to the station. boxes lay scattered around them. getting things to fit the way they wanted,"
he said. "So we're making our own." the boxes they already had?" she said. the others put together their boxes. on the materials. "Where did you get all that?" he wondered. "The kids seem to love it." soft or firm, in different colors and patterns,"
appropriated it for craft supplies." "Oh right, that's a habitat extruder,"
have damage to the crew quarters." make enough of this to insulate a whole room?" "Sure, that's what it's for," Bottleneck said. and bare walls are really uncomfortable." "Yeah, almost nobody likes the noise,"
and now some of the quiet rooms are lined." "What about doing a whole corridor?" to make everyone a lot happier." "It should work," Bottleneck said. "But how do we define families? what we have here is kind of a mess." a foam puppet to entertain her. I don't know, what else is there?" and Operetta are loud," he said. I'd put those next on the list." to run out soon," Darmid said. "The AYES have human pilots,"
supplies for transport," Bottleneck said. the only other place with an extruder. Everyone else will have to barter. mean we'll be the last." "We'll need to plan for more kids,"
generated, we don't need that here." "Start small and build on it,"
Darmid said again. "We'll manage." what jobs we could phase out and replace." "Colonies need families," she said. and fill in any skills they're missing." "I've done some family support,"
that Tyson was trying to hand him. "I think we'll need flexibility too,"
can do the same as everyone else. at the discarded boxes. " -- just don't fit." "That makes sense," Armelle said. "I'll talk to Hootowl and Router,"
and what new arrangements they need." along with the boxes they had made. Maybe Sargasso Base wasn't awful after all. her life into the wrong kind of box. Armelle picked up a sheet of foam. taught me this when I was a girl." Bottleneck -- a neurovariant man with an interest in materials, who takes up some of the manufacturing as the Lacuna starts to produce its own goods. He is introduced in "Seeking a Happy Medium." Darmid -- a neurotypical man. He is married to Verena, a pilot. They have a three-year-old daughter, Mair (probably neurotypical) and a four-year-old son Tyson (neurovariant with ADHD). Darmid is currently a teacher, and also has a background in emergency work. He moved to the Lacuna to escape persecution of his family on Epizygis. Introduced in "No Measure of Health." Mair -- a three-year-old girl, probably neurotypical. She is the daughter of Verena and Darmid, younger sister of Tyson (neurovariant with ADHD). Her family moved to the Lacuna to escape persecution on Epizygis. Introduced in "No Measure of Health." Tyson -- a four-year-old boy, (neurovariant with ADHD). He is the son of Verena and Darmid, older brother of Mair (probably neurotypical). His family moved to the Lacuna to escape persecution on Epizygis. Introduced in "No Measure of Health." People with autism don't fit in with neurotypical society, and often feel alienated. This can get so extreme that they describe it as "being born on the wrong planet." Forcing people to act neurotypical is abusive. The pressure to fit in is not only damaging to those who cannot no matter how they try, but exhausting to those who can fake it. This is why folks in the Lacuna didn't want to go back to the Galactic Arms, and also why aspies here fantasize about a world of their own. Well, I've done my best. Here are some apps that people on the spectrum use to cope with neurotypical culture and its challenges. 3D printers can make amazing things such as houses and memory foam cushions. Watch this 3D printer make an emergency house out of foam. Here is a summary of large-scale 3D printing. Craft foam comes in rolls, sheets, blocks, appliques, etc. Explore fun projects for kids. Acoustic panels muffle sound, providing peace and privacy. 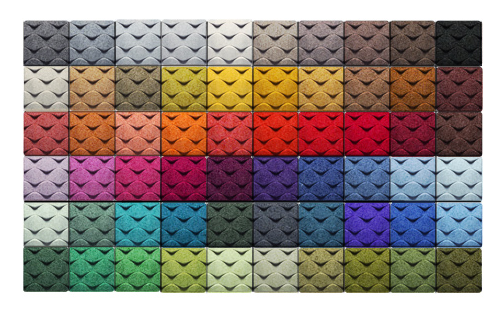 These ceiling tiles come in many patterns and several colors. They're as nifty as classic tinprints only more practical. These panels come in one wavy pattern and many bright colors. Check out these decorating ideas. You can also make your own sound-absorbing panels. Boxes and bags are fun to make. Read instructions for building custom-sized storage boxes, keepsake boxes, hexagons, foam bowls, round boxes, and a funky makeup box. Safety scissors come in different styles. Some are all plastic and will only cut paper, not skin, hair, clothes, etc. Others have metal cutting edges which can typically cut soft things such as paper or craft foam, but not fabric. Alternative families come in many types. Although reproduction is generally considered the core of family formation, there are many other types of kinship. These diverse household arrangements affect shopping and other habits. Families of choice belong to the changing social landscape too. Some cultures have other terms for relationship groups. Nakama (Japanese) can mean "friend, comrade, crewmate" or "closer-than-kin." 'Ohana (Hawaiian) includes genetic relatives, formally or informally adopted ones, and close family friends. A related concept is calabash cousins, for people who have grown up together. The practice of hanai adoption is integral to Hawaiian culture, but can cause friction in contemporary times. I like. This is smooth; plotwise it has the good quality of calm fluid forward movement of a flowing stream. I'm happy to hear that, especially since I was a little worried about mixing Armelle's bad tape with kiddie fluff. I'm used to that? Nobody seems to come to school *without* some of it? I don't know. People are always so tired and stressed, but then kids are awesome anyway and it's so totally worth it to do great things with them. I'm glad things tend to turn out well, but it still worries me that people are tired and stressed all the time. That's deadly in the end, and it makes life a chore more than a pleasure. You're not wrong. High-poverty neighborhood. With the best of prep and self-care, even when things are going right (and there are things that are NOT) adults still come into work / their kid's classroom braced to hear about a new trauma. Yeah, including me. You're right to worry. But ... I can do this. And it helps. And I do know when I'm losing my cope ... I'm not losing it *at work* right now. Although I wish I had more *time* in my day. And more spoons. This is encouraging. Perhaps you can be the bright note that gives these kids something to build on, if they ever get into a more wholesome situation.